The past months have seen the country nervously watch dam levels as they shrink daily. Gauteng experienced a near miss in the last months of 2016, with the Vaal system only being saved from collapse by last-minute water transfers. The Western Cape is now also watching it’s lifeblood—the Theewaterskloof Dam—as it depletes day by day, with less than 100 days of water left for all its citizens, pets, livestock, agriculture and industry. This is a tangible lesson of a long known truth: our ability to sustain our societies and economies relies on the availability of water. Yet, our historical response has never matched the severity of running dry. There are a number of reasons for this, not least that water in South Africa has been too cheap. It seems that because we’ve been spoilt, we have an innate assumption that water will be on demand at a given quality, quantity, and price. This assumption simply no longer holds,” states Lise Pretorius, Sustainability Consultant at consulting firm GCX Exchange. GCX says these figures suggest it is the quality, availability and price of water that can shift entire industries, affect their global competitiveness and disrupt supply chains. For the most part, however, South African companies are generally not applying sufficient resources to understanding the risks associated with this reality. In this context, business leaders—through regulatory, investor, and consumer channels—are being called on to develop informed and engaged response strategies to the risks that they both impact on and are impacted by. Roy Henderson, CEO of Green Cell Technologies agrees it currently takes significant amounts of water to produce human and animal sustenance, and although he and business partner Jan Vlok, did not set out to specifically invent a way to save water in the food manufacturing industry, their patented technology is doing just that. The Disruptor™ and the Dynamic Cellular Disruption® (DCD) process are revolutionising the way in which food stuffs and beverages are made. Processing the whole plant (skin, seeds, pips, stalks and all), and releasing up to 99.99998% of the available nutrients, DCD does away with waste to landfill and has a host of other benefits too. One of these is the reduction of reliance on water to process the material, requiring little to none (dependent on the source material), save for in the preparation phase where washing is required, but even this is reduced as DCD also inhibits microbial activity. The actual amount of processing equipment and machinery is also lessened, so there is a corresponding decrease in the amount of water required to clean equipment. Henderson comments that it has taken the world reaching the brink of disaster and staring into the abyss to start appreciating the urgent need to modernise attitudes and processes, yet the company still meets with resistance to change from large manufacturers, as it’s easier for the incumbent old guard to stick with what they know. However, they may soon not have a choice, as the ‘expense’ of manufacturing using traditional methods is starting to dictate alternatives. GCX and Green Cell Technologies are both of the opinion that business and industry need to see water saving as a bottom line item. Utilising water more effectively and planning upfront for how it is deployed, and adjusting how they operate can increase profit margins in the short and long term. There are a number of tools or strategies that companies can use to start this process, but almost all will start with getting accurate data. Companies should be able to answer questions such as how and where they use water, what the external physical or institutional risks are in the areas they do business, and where changes in water quality, availability, or price would most materially affect the business. Through initiatives like CDP Water, through which companies disclose and reduce their water-related risks, investors are starting to factor this sort of information into their investment decision-making. Tackling the crisis from the other end, Hendrik Kuhn, Managing Director at Enviro Conscious Technologies© is working to manage wastewater and sanitation infrastructure, as it is not only how we use our fresh and potable water that matters, but also what happens to it after it has been exploited. Until now, installing wastewater management and sanitation infrastructure required massive scale and huge investment. However, strides in technology have facilitated a wave of custom built, fully scalable wastewater and sanitation solutions that are cost effective, quick to implement and most importantly, require no pre-existing wastewater infrastructure. Examples of where these systems can have a huge effect include rural schools, communities and even domestic households, but especially businesses with a direct saving on both Capex and Opex budgets. Construction of traditional sewer infrastructure at a base rate of R3-million per km and escalating connection fees for example, is negated when installing a decentralised wastewater treatment plant (WWTP). There is also a 50% saving on fresh water usage by reusing the treated wastewater for flushing toilets and irrigation et cetera, which, again, translates back into greater margins. These types of systems also allow for rapid scaling and continued development across the board where existing Municipal infrastructure cannot support future growth of hotels, housing developments, schools, shopping centres, hospitals and office buildings, for example. The same can be said for mines, whose toxic waste is well-documented for poisoning our precious ground water systems. Add to that the benefits of water conservation through the biological recycling of wastewater and independence of existing municipal infrastructures, it’s difficult to understand why we are still considering outdated methods when planning for construction. There are also other less costly and even more practical and immediate solutions at hand, like waterless bathing products. DryBath, developed in 2012 by 22-year-old South African college student Ludwick Marishane, is a waterless shower gel rubbed onto the skin. In addition to its water saving properties, DryBath kills bacteria, cutting down on germs and the disease rate caused by poor hygiene in rural areas. It also moisturises the skin, leaves a fresh scent and is extremely affordable, although not as widely available as it could be. Other cost-effective measures include installing rainwater tanks, which is now mandatory for all new builds in places like Kenton-on-Sea, although, of course, this depends on there being rain in the first place. 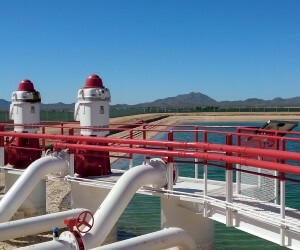 But, in the absence of rain, other possible answers to better use water include desalination. This is not an immediate fix but one that must be considered. A study in 2006 by the United Nation's International Atomic Energy Agency (IAEA) showed that 2.3 billion people on the planet lived in water-stressed areas, 1.7 billion of them having access to less than 1000 m3 of potable water per year. With an ever-increasing population, these figures will worsen. While water (if we have it) can be stored, electricity at utility scale cannot. 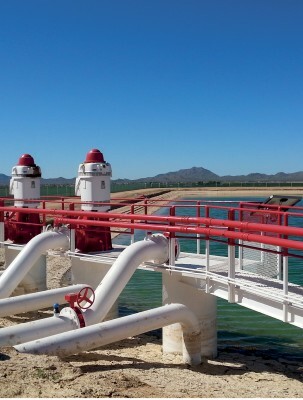 According to an article on the World Nuclear Association’s website, World Energy Outlook 2016 reported that in 2015, there were about 19 000 desalination plants worldwide, with an available production capacity of about 15 billion cubic metres per year to provide water to both municipal and industrial users. Almost half of global installed desalination capacity was in the Middle East, followed by the European Union with 13%, the USA with 9% and North Africa with 8%. Southern Africa did not feature. Globally, seawater is the most common feed water type, supplying about 60% of installed capacity, followed by brackish water at over 20%. Southern Africa did not feature. Globally, seawater is the most common feed water type, supplying about 60% of installed capacity, followed by brackish water at over 20%.With our coastline, South Africa should be taking desalination a little more seriously. Not only to power electricity but also for drinking water, such as happens in the Mossel Bay project, SA’s largest seawater desalination plant. Built in record time because of the severe drought conditions experienced in the Southern Cape, the plant has an output of 10 megalitres of potable water per day for domestic and other uses and diverts 5 megalitres to PetroSA’s refinery. While a shining example, it was, nevertheless, a reactive measure. One of the reasons why desalination has not been given too much serious thought is the debate around the cost of running costs of operating the plants (either fixed or mobile), such as the expense attached to reverse osmosis. But now, faced with the very real prospect of not having any useable water at all, this cost is academic. However, before the water runs off into to the sea where it will need to be converted again, how about building more dams or raising the walls of existing ones?. One of the reasons why desalination has not been given too much serious thought is the debate around the cost of running costs of operating the plants (either fixed or mobile), such as the expense attached to reverse osmosis. But now, faced with the very real prospect of not having any useable water at all, this cost is academic. However, before the water runs off into to the sea where it will need to be converted again, how about building more dams or raising the walls of existing ones?.How about not cutting down our trees “because they take up too much water”, when that water is flowing out to sea because there is nowhere else for it to go and we need trees in the first place, to help generate the life-saving rain (as it doesn’t make itself).Our forests and rivers are an integral and vital part of this planet’s entire sustenance system. If we fail to look after any one aspect of this life-dependent covenant, it will no longer be able to look after us.Right now, though, there are more questions than answers to the water crisis. Water is a great leveller—it doesn’t matter how rich or poor we are, without it, we won’t exist. While changing consumption habits of all products—from clothes to our food, our transport habits and how we clean ourselves may help but, in the end, though, it comes down to our attitudes—how seriously do we want there to be a tomorrow?